Michael Tomasky is the editor-at-large of The American Prospect. 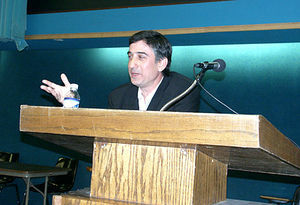 Michael Tomasky, editor-at-large of The American Prospect magazine, told a UW-Green Bay audience Monday, April 30 2007, that liberalism has its best opportunity in years to gain a strong foothold in American political life. Visiting UW-Green Bay as part of the Historical Perspectives Lecture Series, Tomasky said the average person has seen conservative governance fail them in recent years. Tomasky was invited to the university by Democratic Socialists of America member, prof. Harvey Kaye. Michael Tomasky, of The Guardian, was an identified member of JournoList - an email group of approximately 400 "progressive" and socialist journalists, academics and "new media" activists. JournoList members reportedly coordinated their messages in favor of Barack Obama and the Democrats, and against Sarah Palin and the Republican Party. JournoList was founded in 2007 and was closed down in early 2010. 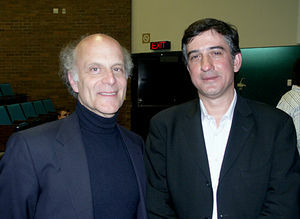 In 2009 Michael Tomasky was listed as a Contributing Editor of The American Prospect. This page was last modified on 3 March 2012, at 18:03.